› Grow Anywhere - Shade to Sun! › Sun Lovers! All Day Sun! We always welcome your comments and suggestions! Mischel's Greenhouses provides you with top quality, healthy, garden-ready plants direct from our greenhouse to your home, guaranteed! 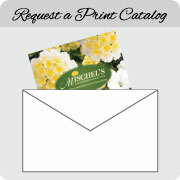 Established in 1985; Mischel's Greenhouses, Ltd is a family-owned and located in northern Lower Michigan. Thank you for stopping in to look at our products, we hope you enjoyed your visit and wish you a happy growing season! Copyright Mischel's Greenhouses Ltd. All Rights Reserved. eCommerce Software by 3dcart.